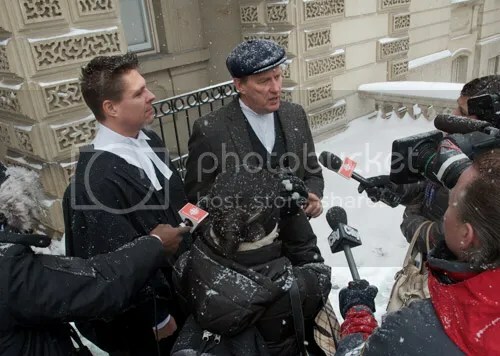 Lawyer Derek From and farmer Michael Schmidt hold a news conference on the steps of Osgoode Hall in Toronto February 5th. The results of the appeal are not expected to be announced soon. Edited and compiled by Raoul Bedi, BASc (www.biofield.ca ). 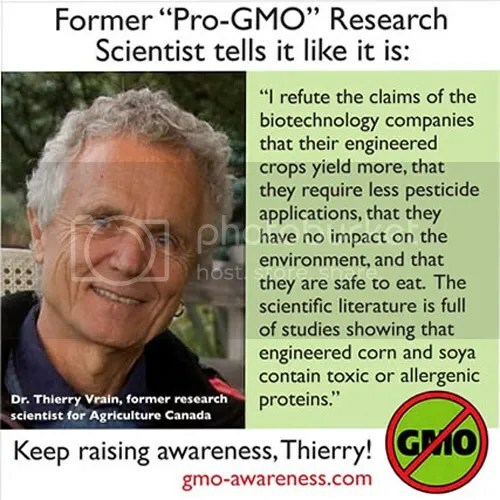 This is a sampling of some important articles and campaigns in the world of anti-GMO activism during the month of June 2013. 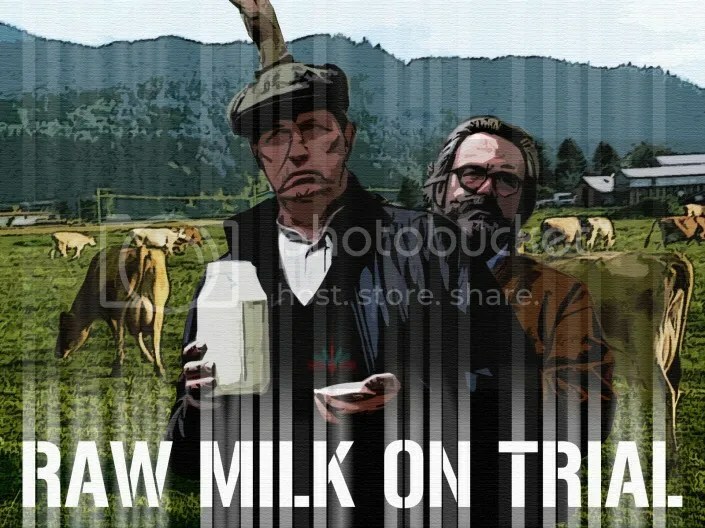 DURHAM – Local raw milk advocate Michael Schmidt’s appeal of a British Columbia judge’s contempt of court finding against him is based what he views as the lack of proof anyone drank his milk and lack of clarity of the court order he was found to have breached, he said Tuesday in an interview. Schmidt said he restructured a Chilliwack, B.C. dairy farm to produce cosmetics to comply with an injunction which ordered him and others not to package and distribute unpasteurized milk for human consumption. Raw milk farmer Michael Schmidt to appeal contempt conviction in B.C. 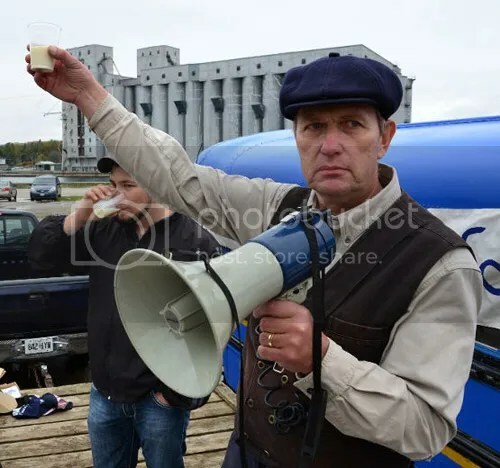 Michael Schmidt raises a glass of raw milk in a toast to his supporters at a raw milk rally outside the Grey Bruce Health Unit in Owen Sound in October 2011. Photo via Owen Sound Sun Times. 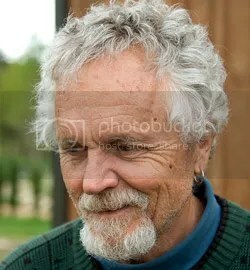 “Local raw milk advocate Michael Schmidt is appealing a British Columbia Supreme Court judge’s finding of contempt against him for violating an injunction to stop the distribution of raw milk for human consumption under the “ruse” of saying his raw milk was a cosmetic. 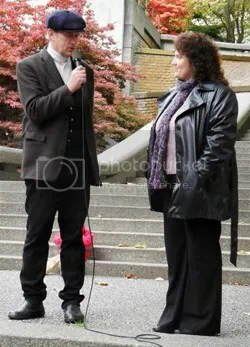 Michael Schmidt, Alice Jongerden, at a rally in BC November 2, 2011. Photo by Tirra Del Giudice. Click image for more pictures from that event. The Bovine: There’s a major raw milk symposium in Vancouver April 6th and you’re one of the speakers, Alice. Could you tell us a little about what you’re going to be sharing with the participants at that event? 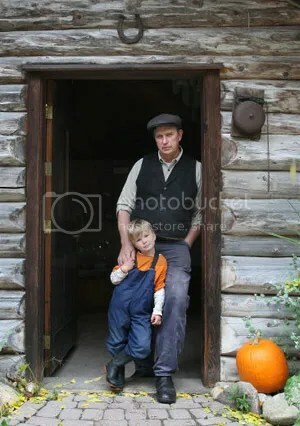 Alice Jongerden: I will be sharing my story and discussing the Challenges of Farming, Losing the Family Farm, and what is needed to bring it back and how that can be done. Also highlighting herdshares, and why they make sense. Raw milk family’s day in court in B.C.